The new 73,500 sq. ft. Auburn University Montgomery Wellness and Sustainability Center officially opened in August 2012. The $17 million facility serves as a new gateway to the campus, inspiring personal health and serving as a model for sustainable buildings. 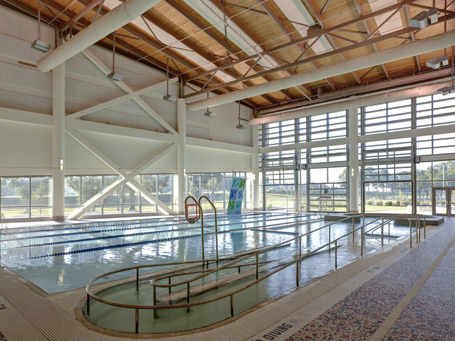 Features of the wellness center include a natatorium, weight training and cardiovascular areas, a track, a climbing wall, and a multipurpose gymnasium. The center also includes sun garden classrooms, performance labs, and other program spaces designed to encourage people to make healthy life choices. Meeting the criteria for LEED certification, 360 Architecture, in association with Infinity Architecture, designed an environmentally sensitive building that includes a reflecting pool to capture and filter storm water runoff into surrounding bioswales and rain gardens.